This southwest-facing beach is home to Santa Monica Pier and Pacific Park amusement park. It's just below downtown Santa Monica and is near the Third Street Promenade. I like Santa Monica Beach for its beautiful views and how close it is to the amusement park on the pier. The oceanfront path is great for a walk or a run. It can be too busy in the summer or even on a beautiful day in winter. What is There to Do at Santa Monica Beach? The beach is wide; the sand is well groomed. In the busy season, you'll find lots of lifeguards on duty during daylight hours. A few people swim in the chilly Pacific. A lot more just like to wade in and splash around. 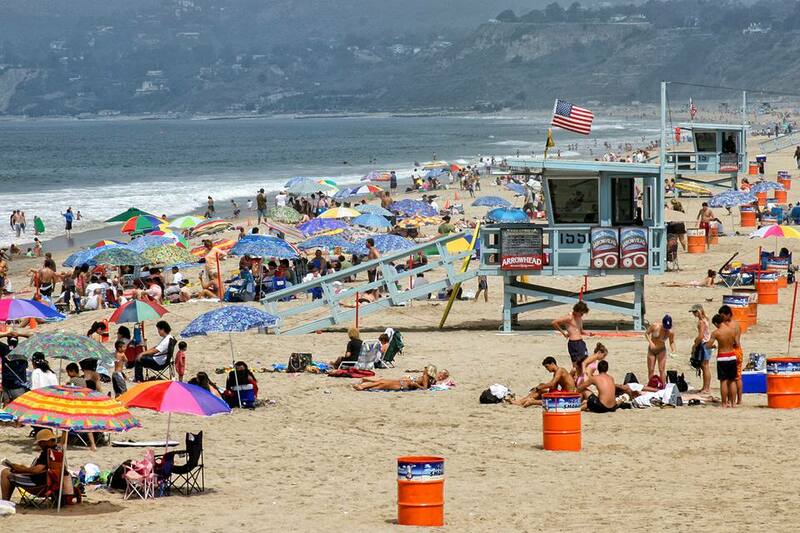 Our readers and online reviewers say Santa Monica Beach is best for people watching. They especially like the "Baywatch lifeguard towers... volleyballers, various people fitness freaks doing yoga etc, the scores of runners, cyclists and dog walkers." After that readers like it for swimming, bicycle riding, surfing and beach volleyball - in that order. When the waves are big enough, you'll find people surfing north of the pier. And there are beach volleyball courts to play on. By far the most popular part of the beach is the walking and biking path. You could go for miles on the flat, paved path - on a bike, skates, walking or running. The path runs from a little north of Santa Monica Beach all the way to Redondo Beach, about 25 miles in all. If you're going to Santa Monica for more than just a day, here's how to plan a weekend in Santa Monica. Heal the Bay rates California beaches for their water quality, giving grades for both wet and dry conditions. Use it to find out more about what things are like. To reach Santa Monica State Beach, take I-10 west to where it ends at Pacific Coast Highway (CA Hwy 1). Several large, paid public parking lots are just north of the pier along Pacific Coast Highway. The beach doesn't stop at the pier and you can also park south of it. Take Pico Blvd west to Appian Way and turn right. You'll find a couple of public lots along Appian and more near the intersection of Ocean Ave and Hollister Ave.
You can also park downtown on top of the cliff. That's a good choice if you plan to do something else there after you're done at the beach. To get down to the beach from up there, take the pedestrian bridge that goes downhill between Broadway and Santa Monica Boulevard. You can also walk down on Colorado Boulevard, which goes straight onto the pier.